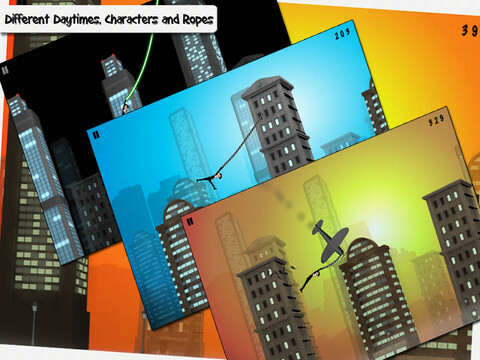 Rope’n’Fly – From Dusk Till Dawn is an iPhone app developed by Robert Szeleney. Upon first glance it doesn’t look like much, but the more you play it the more you’ll fall in love with it. I personally downloaded Rope’n’Fly as an iPhone app, yet it’s also available on the iPad and the iPod touch as a universal app. 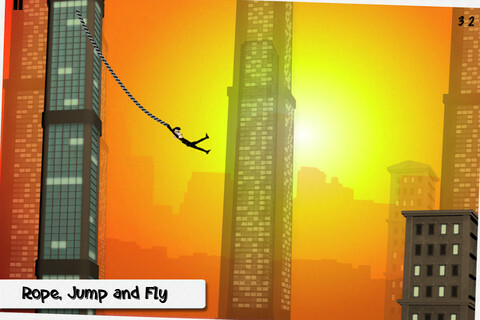 The basic gist of Rope’n’Fly is that you’re swinging from building to building, trying to achieve a high score, whether it be in distance or time. You swing across the screen by pressing on buildings, which then allows you to throw out a rope, which sticks to the buildings in a way that’s reminiscent of Spiderman. I actually can honestly say that I’ve never played an app quite like this. One thing that I really love about it, is that it’s one of those apps that you can pick up and play during a commercial break, or while you’re in the bathroom, or while you’re waiting on line. It’s engaging without forcing you to invest a certain amount of time in it, which is so important to me when it comes to mobile apps. Rope’n’Fly can be a bit frustrating at times, seeing as you can sometimes draw the short straw (or rather, a short building) and end up hitting the ground just because of dumb luck. But the play length is so short, that you end up getting over that frustration very easily. There are tons of different ways for you to play the application . For instance, you can actually change your own overall goal in the game . It allows you to choose between a distance goal, a time goal, or a goal based on how many ropes you use. Or, if you want, you can simply play in “free” mode and play without any limits. On top of the ability to control your overall game , you can also customize your character and screen. It allows you to choose your character, whether you want to play at night or in the daytime, and what type of ropes you use. The graphics, as a whole, have a really specific charm to them. They aren’t anything over the top or too special, but they’re still cute and keep you tuned in. Perhaps it’s my own crude sense of humor, but I find it hilarious every time the guy hits the bottom of the screen and just falls apart, no blood involved. He just pops apart like an action figure and it’s kind of hilarious. It definitely gives the app a bit of pluck. Needless to say, I thought this app was insanely fun and at $0.99, I’d say that Rope’n’Fly is definitely worth the buy. AppSafari review of Rope’n’Fly – From Dusk Till Dawn was written by Darius Reimm on November 3rd, 2011 and categorized under Action, App Store, Arcade, Featured, Games, iPad apps, Universal. Page viewed 4474 times, 2 so far today. Need help on using these apps? Please read the Help Page.